Click on the image above to request our ISO 9001:2015 Certificate. 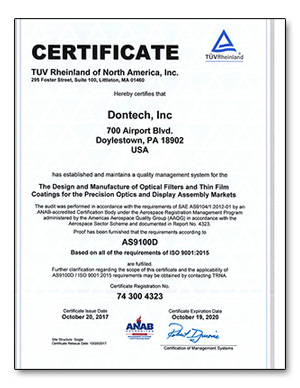 Dontech, Inc. is an AS9100D and ISO 9001:2015 certified designer and manufacturer of optical filters and components for electronic display enhancement and optical assemblies. Optical products are sold separately or integrated for customers. Since 1971 Dontech products have been integrated into display systems to enhance contrast, reduce reflections, suppress radio frequencies (e.g., EMI/RFI shielding), provide night vision compatibility, and increase the thermal operating range of displays. Dontech will integrate its optical products into electronic displays (e.g., LCDs) and bezels for its customers. Commercial off the shelf (COTS) displays can be customized by Dontech to improve the optical performance, operating thermal range, EMI/RFI emissions/susceptibility, and mechanical durability. Dontech enhanced display solutions allow the display to function properly in demanding environments, such as direct sunlight, low or high temperatures, or military environments. Dontech’s engineering and manufacturing facilities are located in Doylestown, PA, USA. Primary markets include military, avionics, medical, industrial and electronic instrumentation. For over 35 years Dontech has supplied its products and services to an international customer base. For additional information on Dontech and its products and services, please download a copy of the Dontech Window Design Guide, Corporate History, or contact a Dontech Sales Engineer. Dontech’s vertically integrated manufacturing facility includes new engineering and administrative offices and over 10,000 sq. ft. of “clean room” optical lamination and thin film coating laboratories for manufacturing display filters, optics and providing display enhancement services.